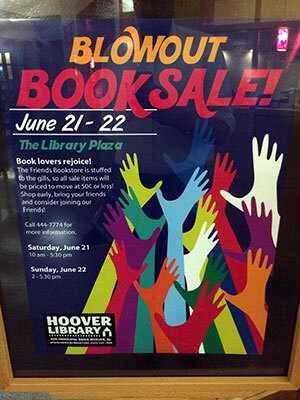 This weekend there is a massive used-book sale at the Hoover Library. Looks like hardback books will be $1 a piece and paperbacks will run cheaper. Definitely worth checking out. The sale will be open on Saturday, June 21st, 10:00 a.m–5:30 p.m. and then open again on Sunday, June 22nd, 2:00 p.m.-5:30 p.m. The sale will take place at the Plaza near the Friends of the Hoover Library Bookstore. But be sure while you are there to check out the “extra book room” downstairs. This room is usually full and the books found here are all for sale and always $1. But this weekend it sounds like the $1 fun is spread out through all of their books.